A bill that is being circulated in the Legislature – SB 419/AB 503 – threatens teachers’ rights to access the statutory grievance procedure that includes review by an impartial hearing officer. WEAC has issued an Action Alert. Tell the bill’s authors about your concerns! Note: Teachers in the Milwaukee Public School System would not be impacted by this bill, because they are not covered by the nonrenewal statute. The current laws governing grievances and nonrenewals provide separate and independent rights. Under the nonrenewal law that applies only to full-time teachers, teachers have the right to a private conference with the school board prior to a decision to nonrenew. Under the grievance statute, employees must have access to a review process after a decision has been made, including a hearing before an impartial hearing officer, which allows the employee additional time and opportunity to prepare and submit testimony and evidence related to the nonrenewal. Therefore, it is critical that the legislature allow teachers access to both procedures. The bills have been referred to committee, and no public hearings are set. Read the fiscal estimate. Members of the Milwaukee Substitute Teachers’ Association (MSTA) hold signs outside of Milwaukee Public Schools (Photo: Joe Brusky). Substitute teaching is not for everybody. I am in my sixth year as a substitute teacher in Milwaukee Public Schools. Every day I am reminded of the tremendous rewards working in public schools. It is wonderful to see a student’s face light up when they figure out a problem or can answer questions about what path they should take in the future. But substitute teaching is still a very challenging job. Taking over another educator’s lesson plans at a moments notice takes talent. It is a challenge, even for the most veteran teacher, to walk into a classroom of unfamiliar students and gain their trust. Classroom teachers spend weeks and months building trust with their students, learning how to connect with them and unlock their potential. Substitute teachers in MPS have been under attack for years. The previous MPS Administration made sure to shred every last ounce of dignity away from professional substitutes–taking away our health care, sick days, and other benefits that full-time MPS employees receive. Without any type of security, who would want to make the leap into substitute teaching? MSTA Secretary Terri Brookshire (Photo: Joe Brusky). Without any incentives to attract and retain substitute teachers, MPS has been reduced to scavenging for substitute teachers through a temp agency, which is not a long-term solution to a teacher shortage. It is reprehensible and sends the wrong message to educators, families, and our children. Not to mention, the temp industry is unregulated and leaves workers with little protections. MPS students deserve professional substitute teachers –teachers who enter the classroom ready to teach and inspire every single day at a moment’s notice; professionals with resources, mentoring, and support, who believe in our children and the MPS mission. The temp industry cannot provide this–only MPS can. Substitute teacher work needs to be done by educational professionals who are part of the MPS family. MSTA President Alex Brower (Photo: Joe Brusky). To attract the substitute teachers our children deserve, MPS needs to offer a quality health care plan to substitutes who make teaching their profession, and end the privatization of substitute teacher work. The temp agency contract with the district expires September 30, 2017 and the School Board has the opportunity to end the substitute hiring provision. The substitute teacher members of the Milwaukee Teachers’ Education Association are ready with solutions to end the substitute shortage. Will the MPS School Board and MPS Administration listen? • Attend the September 12 school board meeting and consider submitting oral or written testimony in support of MPS subs. As educators, we have a moral obligation to protect ALL students. We must support the movement to defend our immigrant students and all undocumented people from Donald Trump during this time of injustice. The Deferred Action for Childhood Arrivals (DACA) program provides renewable permits for nearly 800,000 DREAMers who live, study, and work in the United States–a program that provides opportunities to many of our students. Instead of offering an immigration process that allows a path to citizenship for DREAMers, Trump continues his crusade against immigrant families. His decision to end DACA is especially threatening to our students who haven’t turned 16 yet and are waiting to apply. Trump’s decision to end DACA furthers his white nationalist agenda and threatens the opportunity many of our students have to an education. 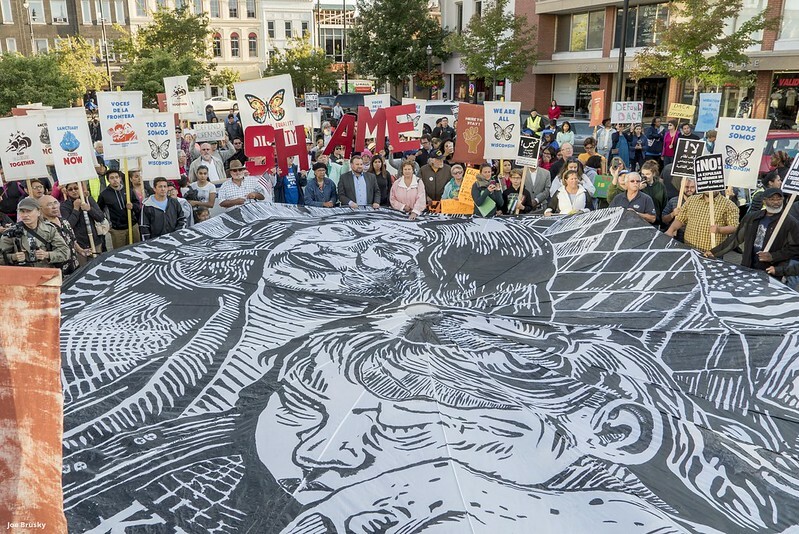 Students and supporters rally to defend DACA in Racine on Tuesday evening (Photo credit: Joe Brusky). Attend tonight’s emergency march and rally to stand in solidarity with those affected by the termination of DACA and to stand up for the legalization of ALL immigrants. Emergency March to Defend DACA / ¡Marcha para DACA! | Wed., Sep. 6 from 6pm-8pm. Consider supporting justice for immigrant families by donating to Voces De La Frontera. Call Paul Ryan’s office at (202) 225-3031 and urge him to speak up for DACA and support legislation that provides protection from deportation and a path to citizenship for immigrant youth! Sign the NEA #DEFENDDACA Pledge, and fight to protect our students. In the coming days students and their families may be looking to you for strength, courage, and answers. Please continue to be vocal in your support of justice for our students and all immigrants in this country. Marching to save DACA in Racine, Wisconsin (Photo credit: Joe Brusky). President Trump has made the unwise and cruel decision to end the DACA program; putting 800,000 lives at the mercy of a Congress that has passed no major legislation. For the past five years, the Deferred Action for Childhood Arrivals (DACA) program proved to be an unqualified success, providing new opportunities and futures for nearly 800,000 Dreamers who live, study, and work in America. The termination of this program impacts students, educators, small business owners, healthcare workers, and so many others contributing to their families, communities, and to the country they call home. Instead of offering an immigration process that will allow a path to citizenship so that DREAMers can continue to contribute to our communities and economy, this Administration has continued its crusade against immigrant families by stripping away their legal status. 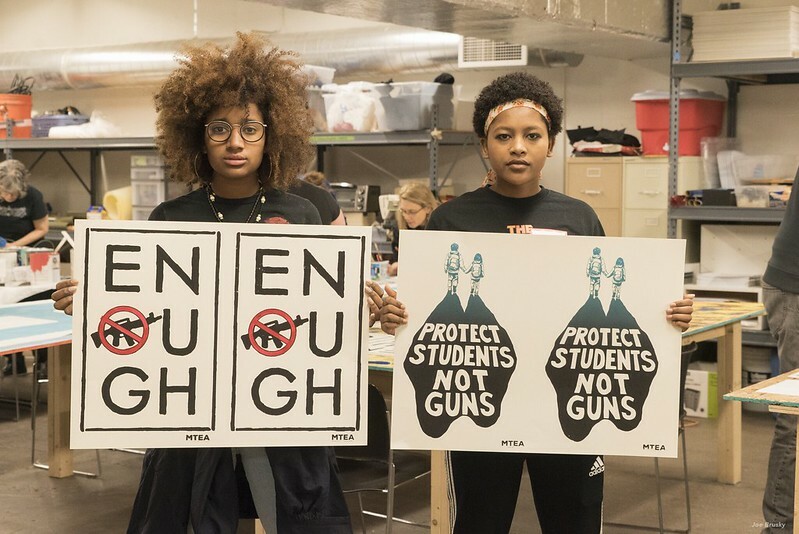 Click here to read the NEA statement. The Deferred Action for Childhood Arrivals (DACA) program is an unqualified success, providing new opportunities and futures for nearly 800,000 Dreamers who live, study, and work in America. They are students, educators, small business owners, healthcare workers, and so many others contributing to their families, communities, and to the country they call home. Yet the future of DACA is under serious threat. A coordinated assault on DACA, led by Texas Attorney General Ken Paxton, hardline state AGs in nine other states, and U.S. Attorney General Jeff Sessions, is trying to force President Trump into ending the program. Instead of offering an immigration process that will allow a path to citizenship so that DREAMers can continue to contribute to our communities and economy, hardliners on a crusade against immigrant families are threatening to strip their legal status away. Click here to help now!